I’m so damn happy we froze as many blueberries last season as we did. The thing about eating “locally” in the winter and early spring is that you have to plan ahead and start preserving in August. Over the years we’ve gotten a lot better at that but it hasn’t always been easy. 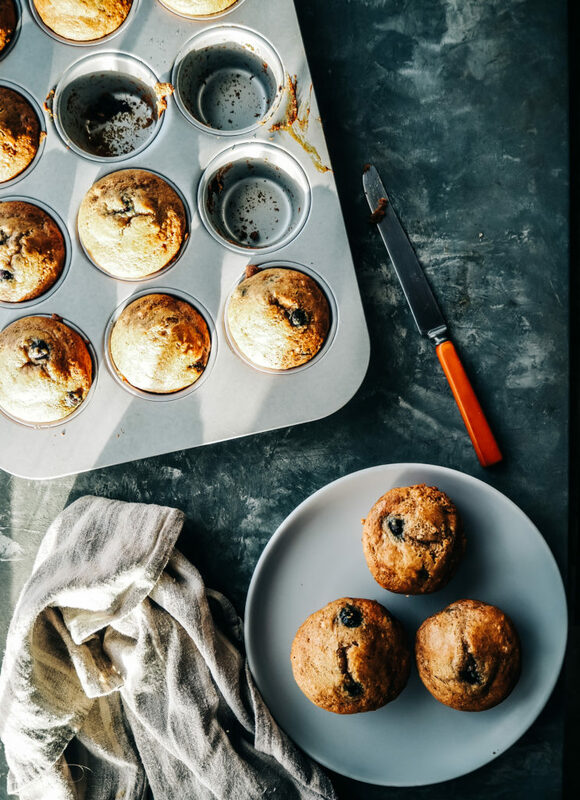 Thankfully, these muffins are made with blueberries that were harvested from our dear friends at Mountain View Orchards just a few miles down the road from Tumbleweed Farm. These muffins are great because they’re a little heartier than a traditional muffin thanks to the ricotta cheese and they’re sweetened with honey which is my favorite way to sweeten up a baked good. Pair with a cup of hot coffee and you’ve got yourself a lovely breakfast or mid afternoon pick-me-up. Preheat the oven to 375F. Grease a standard 12 cup muffin tin and set aside. In a large bowl whisk together all the dry ingredients (flour-ginger). In a small bowl whisk together the ricotta cheese, milk, eggs, butter and honey. Pour the wet mixture into the bowl with the dry ingredients and stir until just combine (lumps are fine, you don't want to overwork the batter). Gently folk in the blueberries. Spoon batter into the prepared muffin cups and place in the oven. Bake until golden brown and a toothpick inserted into the center of a muffin comes out clean. 20-25 minutes.